The AIM NetworkNews and PoliticsDay to Day Politics: For an evaluation of what a splendid education can do, just look at the cabinet. Day to Day Politics: For an evaluation of what a splendid education can do, just look at the cabinet. Australia has a need for many things but there is none greater than the need for equality of opportunity be it employment, equal pay, or whatever. But there is none greater than the need for equality of opportunity in education. That is what Gonski was all about and for any Australian Prime Minister, to divest himself of any responsibility and advocate a segregated system is an unmitigated disgrace. It was only a few months ago that the Education Minister Simon Birmingham was being applauded for his reasonable approach to the education portfolio and his willingness to admit that many private schools were grossly over-funded. But then we learnt that it was a cloak and mirror trick picked out of the Coalition’s tophat. Before then, research by Jim McMorrow revealed that along with getting rid of Gonski, the Coalition would direct money away from the public schools and students that need it most. Even when it’s suggested that equality of opportunity in education is a noble pursuit and the right of every child, people like Christopher Pyne – when he was Education Minister – used to say it was class warfare and he ludicrously described the Gonski reforms as such. Mind you, at the same time he confessed to never having read the report. Now years down the track we have the farcical situation where education is still a mess with the Coalition having a secret slush fund to top up the funding of the private school system while taking money from the Catholic School system. Why is it so? Why do we deny every kids right to a decent education? You would think that even conservatives – when they look into the eyes of the innocent child – wouldn’t deny them an education equal to that of any child. After all, they could churn out capitalists who might vote for the party. As it stands, once my generation has passed on their voting pool will be very shallow. One of the problems with secondary education is perception. The perception that Catholic and Charismatic Christian schools are private. The perception that your child will on completing their 12th year will be better-educated than the one that goes to a public school, whereas there is evidence that clever kids survive well in any environment and less smart ones do marginally better in a private school. Then there is the elitism involved with private schools and the cultural snobbery. And of course the parents avoid the their educational responsibility saying that for the amount they are paying, it’s the schools problem. When you look at the results it can be seen that given similar resources public schools perform just as well as private schools. You don’t have to pay $25,000 a year. So, one has to ask why the lowly paid taxpayer has to contribute to the educational costs for the son or daughter of a wealthy businessman when equality of opportunity doesn’t exist for their own. Of course, conservatives would like all education to be privately run as they would with health and many other things believing that, ideological speaking at least, that private enterprise runs things better than government. Education Minister Simon Birmingham at the time said; “the deal would deliver about $2,300 per student to schools in the next few years. Well, it seems that this conniving twit was just playing with the educational desires of parents and kids and at the same time conning the Australian population into believing they were getting something they weren’t. What conniving fallacious Ideologues they are! PS For an evaluation of what a splendid education can do for you just look at the cabinet. Great article John – interesting to see the behaviour of the private schooled cabinet. I know that Tanya Plibersek has been attempting to uncloak Birmingham’s lies and deceitful behaviour for some time. 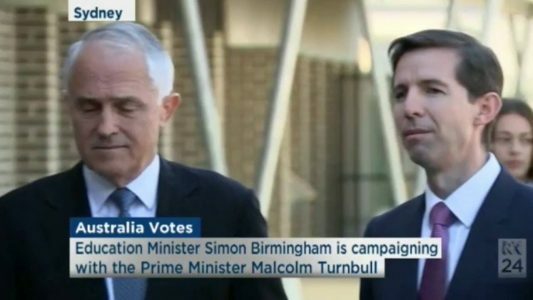 Specimens of the calibre of Turnbull and Birmingham think it is acceptable to lie, cheat, steal, deceive and sabotage to gain advantage, and that to achieve an outcome any means necessary are acceptable to them. However I believe the element which makes them SO repugnant is the pleasure they derive from the disadvantage and inequality deliberately inflicted upon others, a distillation of the least desirable of human traits. I believe we’ve all encountered people like them either during our school years or perhaps our lives in general. Eloquent article. Less sure about ‘ After all they could churn out capitalists who might vote for the party. As it stands once my generation has passed on their voting pool will be very shallow’. Aspiring, less educated voters may choose the unthinking Abbot -Hanson Right, while well educated people might turn to socialism or the Greens. Do not think that there is a cause and effect as you suggest. My feeling is rather French in inspiration: ie all kids learn philosophy and logic. But then, France has Le Pen… and Goebbels had a doctorate. I despair. Hi John as always an excellent read. As a a professional educator, of adults not children, I am more worried by the level of post secondary education that the current government has. This government, and indeed Parliament in general, is the ‘most’ educated in our history. What appears to be missing in so many of them is any sense of a moral compass. As you you so rightly put it “What conniving fallacious Ideologues they are?” Any concern about the impact of their behavior on the majority of Australians seems to be completely unconsidered by them. I believe in the importance of access to a good education in the reduction of inequality, but what I see is a group of self-centered, morally bereft individuals who have benefited from their mainly inherited wealth to get a good education. They are now pulling up the ladder after themselves to ensure others without the wealth and contacts are unable to benefit from any form of equitable access to education. Aaah, yes, the “reasonable” Education Minister Birmingham, senator for South Australia…minister when the national regulator for vocational education and training, ASQA – the Australian Skills Quality Authority – found that the TAFE system in his home (ALP governed) state was non-compliant with the national standards for 14 qualifications in late 2017, including critical trade qualifications for plumbing and electrical. Meaning that government funded TAFE in South Australia was at immediate risk of not being able to deliver and assess a range of qualifications essential to all facets of business and the economy – across the entire state of SA. Coincidental that the Weatherill Government had in recent years rejected the free-market obsessed National Training Partnership that has seen industrial scale rorting of billions of dollars from government funded training schemes by unscrupulous private RTO’s , and dared to mandate that the major percentage of government funding in South Australia would be directed to the state-funded TAFE system. And all just a matter of a few months before the SA state election, throwing the state system and government education departments into chaos – and miraculously found to be somehow redeemed and rectified and all sweetness and light compliant again this week, short weeks after the election of the Marshall Liberal government! Evidently the national VET regulator is not to be allowed to go about the business of ensuring the quality of training and assessment in the sector impartially, but can be enlisted as a political weapon in attempts to disgrace and shame political opponents and diverting attention from federal malfeasance and incompetence. Who would have thought…? So, a state election in Victoria in the offing later this year, with the ALP Andrews government having made rebuilding the TAFE Victoria brand a continuing campaign centrepiece of the past three and a half years. What’s the bet we’ll see a large Victorian TAFE dragged into the national public arena having been found wanting in complying with one or more of the fed’s cockamamie band-aids to problems they repeatedly tell us were bequeathed to them by the unholy Rudd/Gillard/Rudd years, and the Gillard created ASQA being the politically weaponised bludgeon of choice? Watch this space. Good read Mr Lord. Education is not my forte and I had a dose of private and public. Just did not like any school full stop but agree with you entirely. I do not only subscribe to the perception that religious schools are indeed private schools. As a so called Lefty I do not believe private schools warrant government funding. Of course the parents of children attending these religious private schools would claim that they pay taxes so their children deserve public purse funding. So I will concede that those parents who chose a private school should be able to recieve tax relief up too (but not one cent more) than the national average per child cost for education. As a signatory of the Universal Declaration of Human Rights, we are required to provide education for our children. Having survived too many years in education in university, plus both private and public schools, I cannot understand how an allegedly “free market misgovernment” can subsidise second rate private schools providing third rate academic programmes when the principles of capitalism require those same private institutions to fail financially and properly pass into the WPB of history. How can any educational administrator justify paying a private school Principal considerably over $200,000 per year plus expenses when a competent state school Principal does a generally better job for considerably less? Coles do not subsidise Woolworths in the retail grocery market so why should the state, as a major supplier of education to the people, subsidise a second rate competitor, simply because the competitor chooses to be academically inferior?? For over 50 years private schools had bleated “equality” while taking more than an equal share of government funding for education while loudly distorting the longer term financial policy for their own benefit. Even so, in NSW, James Ruse Agricultural High School remains the premier school in the state, bar none!!! I think it is the smoke and dagger of the mainstream media that satisfies the reader’s needs and therefore requires no want of inquiret? Equality in anything is difficult because everybody is unique. In our time, laud only 10% matriculated and qualified for a tertiary education. Some had the cash, some worked their way and some took scholarships. Few avoided the exam, barriers. With HECS and the rabbott’s sty extensions most university student would not have qualified for universities of the past. A royal commission into the modern bums on seats driven vice chancellors and CEOs is urgently needed.